The Africa Journal of Management presents a special issue on “Entrepreneurship in Africa: Opportunities for both Africa and Entrepreneurship Research.” published in Volume 3, Issue 1, 2017. 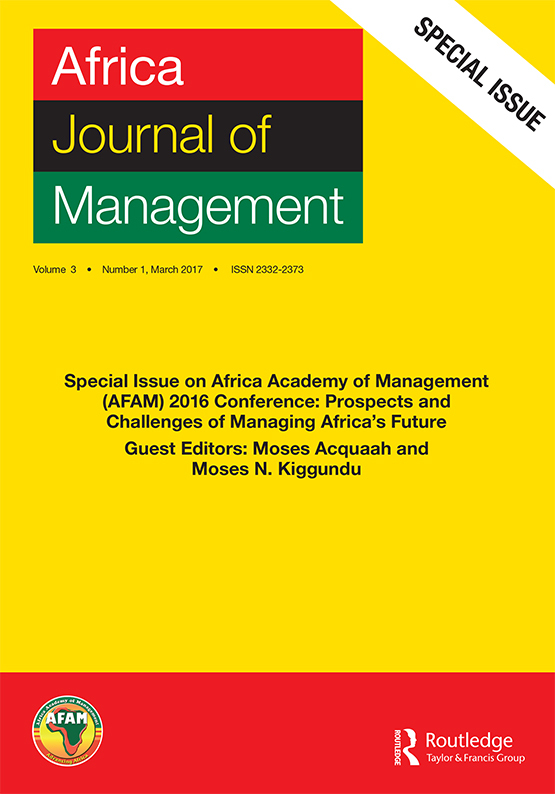 The Special Issue focuses on the theme of the third Biennial Africa Academy of Management (AFAM) conference which was held from 5 to 10 January 2016 in Nairobi, Kenya and is Guest Edited by Moses Acquaah and Moses N. Kiggundu. According to the Editors “for the past decade, the African continent has been experiencing considerable economic growth and this is projected to continue, and even outpace other regions in the world.” Therefore, the theme of the conference focused on the importance of managing Africa’s future. The papers in the Special Issue are divided into two parts: (1) Speeches and experiences of the organizers and the host of the third Biennial AFAM Conference; and (2) Best Papers from the conference. The topics of the research papers cover a broad spectrum of management issues that have the potential to affect the development of sustainable and world-class businesses, and enhance the management of the African continent for future generations. The Guest Editors’ introduction paper, “Prospects and Challenges in Managing Africa’s Future: An Introduction” can be read at no charge here. The NISC partnership has benefited the Indo-Pacific Journal of Phenomenology by bringing sustainability, additional branding and marketing, a wider reach through its websites, and the added value of expertise in the very competitive world of publishing.